We’ve been making innovative audio routers since 1999, and now make the widest range, and arguably the best audio production routers for precision studio work. Each router is fast, flexible, sonically perfect and packed with features to help you get the best out of your work, creatively, quickly and effectively. 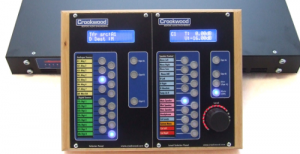 Crookwood make 3 audio routers ranges, and each range has 3 or 4 sizes. This together with a wealth of optional add ons, means that you can get the router you want, and that it will virtually unique to you and your needs. Because all of our routers are constructed from a modular set of control and processing cards however, this keeps the cost down, so all of this flexibility and sonic power comes at an affordable price. Our control panels are small and moveable, so they don’t need to take up valuable desk area, while the remote racks can be placed near the equipment, or in a machine room to reduce cabling. Analogue and Digital Routing for Inserts & Selectors? Then choose our great R1 router to be the heart of your studio. Then choose our R2 router for cost effective, but comprehensive routing. Purely Analogue for Inserts and Selectors? Then our R3 router is the perfect choice to integrate all your existing equipment. If you can’t find exactly what you need from our routers, talk to us. Their modular construction makes it easy for us to customise the features and functions of our routers to meet your exact needs. Just contact us at Crookwood for more information. At the heart of all our analogue routers are relay cards. We’ve used balanced relays from day one, and they are simply the most perfect audio switch available. They are of course, big, heavy and power hungry, but you can’t get something for nothing! We don’t add any active electronics to these relays, so they act like a patchbay, connecting routes as transparently as possible. Our digital routers however use active circuitry to buffer the signals and transformers to isolate and terminate the signals properly. This gives a virtually perfect digital route. Why does this all matter? Well simply put, you don’t want to worry about the sound changing as you patch because of interfacing issues. This piece of mind lets you just work, so you spend your time on creative issues, not engineering ones. All switches are digitally controlled by our flexible control panels. This reduces the effort needed to make a route, and also the thought process: you want to insert a piece of gear in that position? Just push the insert button. Under the hood, the Crookwood router will make 4 individual routes, (stereo send and return), as well as possibly altering a monitor selection. Easy. We uniquely use analogue crosspoint routers for insert routing, allowing you to make up a record chain free-form. You choose what goes in the chain, in what order, and where a parallel path splits, and what’s in that path. And so on. If you have our MS processor option, you can even selectively MS and piece or combination of pieces of gear! What is truly brilliant about the Crookwood is that they’re all made from modular parts. This allows you to specify a router that exactly fits your needs, and you can alter it as your needs change. No more bodging of weird bits of kit to get a feature you need. No built in obsolescence, waste, or unserviceable black boxes, but a sustainable living solution for your mastering now and in the future. One powerful option is our TP trimmer module, which gives you multiple analogue level trimmers and MS controls for your analogue record path. Our routers aren’t the cheapest, but then if you’re going to do a job, you should do it properly. If you look at what they can do, how they can improve your workflow, and then compare, you’ll see that you’ll save quite a lot time and money in the long run. Then when you factor in that they will be quicker to use, smaller in terms of their acoustic footprint and will probably sound better, it just doesn’t make sense to buy the cheapest.